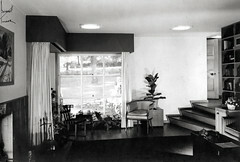 This view of the plant corner windows in the Living Room was taken earlier in the life of the house. Here the color and manner of the valance and curtains matches those used on the north side of the room. Photograph by Bennett & Tucker courtesy of the Harris Armstrong Archives, Special Collections, Washington University in Saint Louis.